ON BOARD THE AIRCRAFT CARRIER GERALD R. FORD ― The Navy’s top officer says the troubles plaguing the Navy’s newest flattop have been solved and he expects that it soon will terrorize foes and fascinate friends. During a Tuesday trip to the ship, Chief of Naval Operations Adm. John Richardson told the carrier’s crew and the gathered media that the bulk of the Ford’s fixes are finished and now it’s time to see what the innovative technology can do. The Ford has moved past the halfway mark on its year-long post-shakedown availability at the Huntington Ingalls Newport News Shipyard. The Ford is expected to emerge in July ready to gradually prepare for the its first overseas deployment, currently slated for 2022. “I’m very confident we’re going to solve these problems. 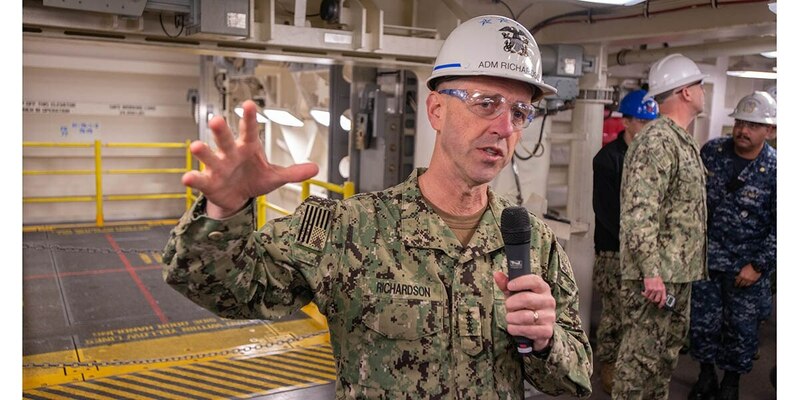 The second ship will have far fewer problems,” CNO said, although he conceded that unforeseen problems could pop up before being quickly fixed, too. The Navy hopes that by the time it starts building the third and fourth carriers in the Ford-class these glitches will be a distant memory. By then, Richardson believes the Ford might be using its mammoth propulsion plant to operate more than just its high-tech catapults, arresting gear, weapons elevators and radar. sion will be to get the warship fully outfitted and then start generating up to 25 percent more combat sorties than Nimitz-class carriers can manage. It’s the Ford’s ability to harness its innovative design to hike carrier combat capabilities that has the fleet “dying to get you out there,” Richardson told the sailors. “We really bit off a lot of advanced technology in Ford. It’s true,” Richardson said. “New catapults, arresting gear, radars and elevators — and the propulsion plant is a big leap forward in terms of power generation. When asked about a report last year from Department of Defense’s Director, Operational Test and Evaluation — DTOE — that doubted the ability of the carrier to churn out higher sortie rates and questioned the long-term reliability of the new flight deck technology, Richardson said he was very confident all of it would work out. To achieve an ultra-high sortie rate, the whole crew must operate in unison with each piece of the high-tech gear, including a new catapult, arresting gear and weapons elevators. They’re aiming to exceed the goal of 160 sorties per day for 30-plus days of sustained flight operations, with a surge capability of 270 daily sorties. Nimitz-class carrier can conduct 120 sorties daily during sustained flight operations with a surge capability of 240 per day. 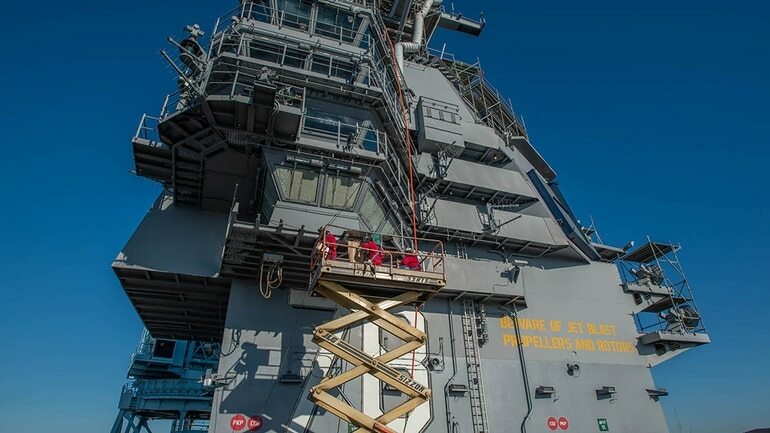 The Ford’s crew expects to get a boost from the new flight deck layout that leaves more open space forward of the island, with fueling stations hidden in multiple locations along the deck. Richardson said that one by one “uncertainties” about the Ford’s new technologies are being eliminated, including EMALS — the Electromagnetic Aircraft Launch System. Richardson also inspected the Ford’s new weapons elevators, which are being installed. Richardson said he expected the progress to go “briskly” and that all but some of the certification paperwork would be finished before Ford’s stay in the yard ends. But he pledged to monitor the work. At times, Richardson sounded more like Navy’s football coach and not the CNO, delivering a rousing halftime speech to fire up the team. Richardson’s words don’t spiral blandly into a vacuum. He increasingly has sounded the alarm about the potential evaporation of American sea power as other nations rise, including China and Russia.